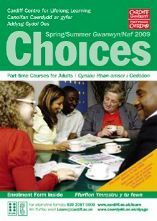 The Centre for Lifelong Learning at Cardiff University has just launched its Spring/Summer 2009 programme of part-time courses for undergraduates and adult learners in the new Choices prospectus. The new Spring/Summer 2009 programme kicks off the New Year with almost 300 courses liste d taking place in 27 locations across south east Wales. You can browse through all the courses in the new Choices prospectus at the Centre’s website, or, alternatively, if you live in the UK you can order a hard copy of the prospectus by clicking here. If you are an undergraduate at Cardiff University you can attend any of these courses as part of your degree. My online course on Tolkien is open to undergraduates and adult learners from anywhere in the world. For more information on my courses please contact me via the contact form here.